No longer titling this a ‘Random Review,’ as I have ‘reviewed’ these to death. Excuse the fact that I forgot how to spell for. I hate typing on cell phone keyboards. I am six and a half feet, more or less, so you can can imagine how big my hands are. I collated this instantly. I felt the excitement of seeing how close I was to finishing the set. When I opened these, the very first card was a rookie that I knew for a fact I needed so I was excited. I picked these up as a treat. I got in free to the hockey game that I went to last night and a Target was down the street. On a side note, I seriously love Division 2 hockey and enjoy the fact that my SoCal alma mater has a hockey team. Below are some of my ramblings regarding the game. ESPN2 is airing Division 1 hockey. Let me tell you why Division 2 hockey is the best based on the game I went to last night. Washington Huskies vs. CSUN Matadors. Besides the fact that its a club sport and athletes don't have the luxuries. Saw a player get checked through the boards opening a corner door. That same player later got a penalty for taking an opponent down via a head slam. He literally grabbed a standing skater by the head and slammed him to the ground. Speaking of penalties. Saw a goalie get a slashing penalty. I can't make that up. There was a parent who was being obnoxiously loud screaming her son's name non stop. I think she got in his head because during one of her louder moments, he got a major penalty. Overall said loud player probably spend the equivalent of almost a full period in the penalty box. He is a forward so no excuse. Well, this short post turned into a lengthy one. I have a box of cards out to open. 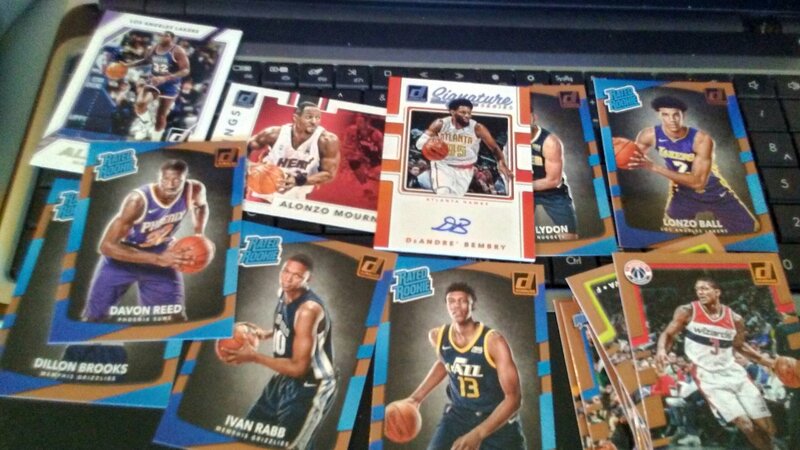 I will do a post in the next few days, and it won’t be a Donruss basketball post. You can currently buy an Edmund Sumner autograph on COMC for 98 cents. I didn’t search too deep but I found 1 comparable autograph to the one I pulled on Ebay for $5 or best offer plus $3 shipping. Regardless, I am pulling for him. I was really happy with this box. I got some rookies that I am missing, pulled a couple extra important ones. Encounting the Retro inserts was fun. I wish it was more plausible to pull more. Maybe when this rookie class comes crashing down to earth in the market, I will pick up a hobby box of this product. This is actually me second Mitchell rookie but I can’t get enough. Even if he busts out, he will be in my personal collection. When I open boxes, I will be doing more of this Twitter pack by pack. Not only is it easier on the website storage but more importantly to me, it is more engaging. I will still post the full results here but be sure to follow me. Let’s start with my thoughts and relevant information on features. Trade: I have caught myself trading just to trade. I wasn’t trading for cards I needed because searching for them is too hard, even with improvements. I have found that cards that fall under ‘Blitz Promo’ has led to my mass confusion. If that category was eliminated or streamlined, I would enjoy it more. I would like to see rewards expanded here; perhaps for team sets. That would stimulate trading. Case Breaker: Nice idea in context but in function it is not great. When you buy into a break they show the sorting of cards which is too slow. The prices are unreasonable; and I am not just saying that because my team is a premium team with this draft class. With the way the app is designed, there isn’t a benefit to your collection and status by just collecting one team. Pack Battle: Cool idea but naturally glitchy since it is new. When the bugs stop, I must say that they do a good job of translating different positions to each other. Contest: This is where the fun is for me. It is probably the only reason why I have stuck around with this for as long as I have. It is like fantasy football redux with cards. My Status: There isn’t a reward for updated statuses. I don’t get why decision makers seem to think that status levels being upped are a benefit for people. They are not. Me having a higher level than others I know means nothing to me, or any rational person. In fact I want a lower status because it means that I have a life away from the app. I do like how they give you options to earn money for packs instead of paying for extra coins. Since a lot of people are unaware of this feature, pictures of where to find it and what it looks like are included below. Not enough emphasis on base cards. Autographs and game used are lost in the shuffle. It feels like they are treated with more value than base cards but less valuable than insert sets. One could argue that they are on par with inserts but to me that is a problem, as I feel they need to be treated with more value. Overall the app does a good job of marketing current card products. Other than the fantasy like ‘contest,’ I feel the product is just another app. It does nothing else. Collectors don’t get any tangible benefits from it. Its great when I have a hunger for cards and can’t afford to buy them but that’s it. I don’t see myself playing beyond the Super Bowl. I have said that I didn’t see myself playing much longer before and ended up playing more. Really though, I say this with a more level head. My usage of the app has gone way down. I really only open it for the contest and to claim more money for when I do want to open packs on it. So if you want to add me as a friend on it, my username is PANDANWH. I add anyone that follows me on it and accept any trade for my doubles. In the time between the last round of these and now; I have officially committed to doing a set of this product. Although I am still hunting for that Donovan Mitchell rated rookie too. He was the man when I saw him against the Clippers last month. This week I bought two rack packs from two different stores. Just because I am building a set, doesn’t mean I can break the bank. When I am in Target, WalMart, or any other store that sells cards, I now have a reason to pick up a pack or two. So I picked up one pack from my shopping trip at WalMart and one at Target. These must have just been put out by Target as everything other current basketball product was still sold out. 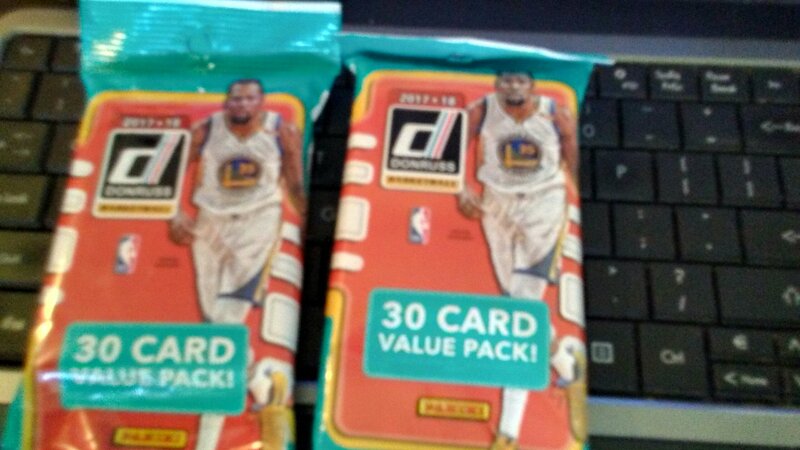 Pack 1: Target, not that it matters because this isn’t a scientific experiment. My first autograph from this product. It is funny how when you are not hunting or thinking about it, things like this seem to find you. Another Lonzo Ball rookie. I believe this is my third. If you can’t make it out, that is a DeAndre Bembry autograph. A three dollar autograph but one I am happy to have none the less. Pack 2: WalMart. A couple duplicate rookies. 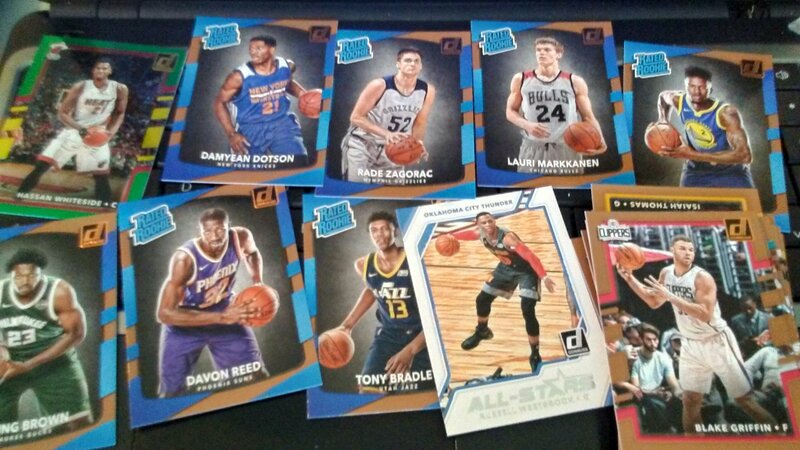 Still no Donovan Mitchell rookie. New Year’s Day can get pretty boring. May I suggest reading my book. You can find it here: https://www.amazon.com/My-Life-Fiction-Coaching-Diaries-ebook/dp/B072S2YL6Q/ref=sr_1_1?ie=UTF8&qid=1514843174&sr=8-1&keywords=my+life+is+fiction+daniel+dubay For those that don’t know, it is my labor of love from coaching youth sports for several years. In the next 24 hours, you can expect my Twitter-feed to be full of pictures from my PackRip.com mailday.